In a world where there is an abundance of delicious food, it is no wonder why most of the population is heading to obesity. While there are many reasons as to why people have packed on the pounds, the top reasons in my book are: the availability of food, the ease of fast food and the general improvements in modern day life that have removed exercise as an everyday activity and replaced it as an optional extra. However not all modern day changes have been bad. While our changing lives have brought about a lot of things that can make us unhealthy, it has also brought about a lot of useful technology that can be used by us to better monitor our lives. Let’s talk about fitness apps and wearable devices that can play a big role in not only changing our lives, but reversing the trends we see across the country. What Is Fitness Apps & Wearable Technology? Fitness wearables and Apps are tech specifically created to track and provide information to use when we exercise. Through the collection of data, we have a better understanding of how we exercise and what we can do to improve the experience moving forward. Wearable devices can connect too many of the best rated fitness apps available for both athletes and new comers. This level of connectivity allows many of us to skip the input phase of fitness stats which commonly occurs after an exercise and instead fast forward to this information being gathered in real time from the devices we wear. Providing an incredible amount of information, it has never been easier to truly understand the benefits of exercise, or fine-tune it to match what our needs are when exercising. What Things Are Tracked By This Technology? 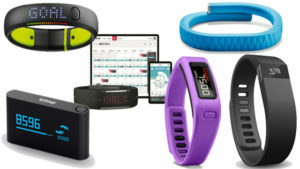 Fitness apps and wearable technology are capable of tracking a number of different things. First, the majority of trackers come with the time, which if nothing else is a useful convenience. On top of that, most models will give you a step counter as well. Showing how many steps you have taken, the device can go further and also show an approximation of the number of calories you have burned. Along with steps, a device can track the number of flights of steps you climb, as well as the total mileage you have covered in the day. Some trackers go a step further by looking at your heart rate and tracking it as well. With this information, you can look at your exercise routine and see what your heart rate was like at every moment. Some go even further and allow you to track your sleep as well.